Hard to believe that it's been 8 months since any Mini action, but after the RSI-induced welding ban and the endless English rain I didn't get much opportunity to work on the car. Well today we started again, it was sunny for a change so we decided to press on with the rebuild. Today my angle grinder broke and I'd run out of sandpaper so any bodywork was out of the question, so instead we decided to get the new subframe ready for build-up and refit. 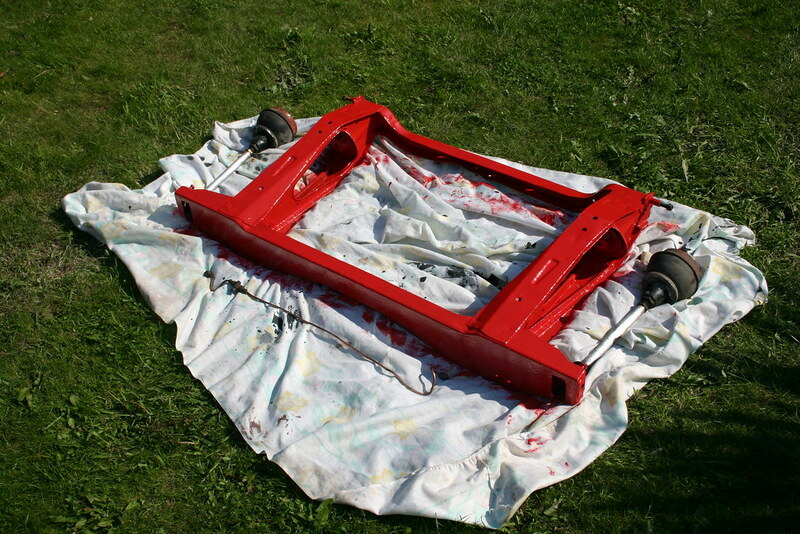 It needed a new coat of paint first, so after much umming and ahhing we opted for a bright shade of Ferrari red. Now it's nice and shiny :-) Next job is to rebuild the rear arms and fit the rebuilt brakes, by which time I might even have got the rear of the bodyshell ready to fit it!